CleanCut announced the launch of the Convertible, a product allowing an existing bathtub to be quickly and affordably modified for use as a full tub or more accessible step-in shower. 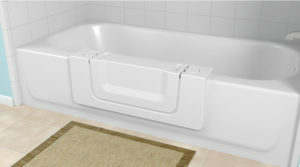 Safeway Safety Step, LLC (DBA “CleanCut”) announced the release of the Convertible™, a product designed to add a removable center section to an existing bathtub for increased accessibility and safety. The center insert portion of the Convertible™ can be added or removed providing the bather with the flexibility to use the tub as a step-in shower or full-bath. Installation of the Convertible™ includes removing a section of an individual’s existing bathtub and custom fitting the resulting opening with the product. The Convertible™ is the latest product in CleanCut’s line of tub-to-shower retrofit conversions that offer a simple and cost-effective home modification solution providing easier access to the bath/shower area. In many cases, the cost to install a tub retrofit is a fraction of the cost compared to full bathroom remodeling, walk-in tubs or custom walk-in showers. According to Chris Stafford, president of CleanCut and a Certified Aging in Place Specialist, “Bathtubs present a variety of hazards that increase the risks of falls and impacts an individual’s ability to live independently. Our Convertible™ product is an affordable retrofit solution that increases safety and allows individuals to remain in their home and reclaim their bathing independence”. Based in Cincinnati, Ohio, CleanCut is the manufacturer and distributor of the CleanCut line of bathtub accessibility products. CleanCut’s tub modification products have been installed across the US and Canada in private residences, senior housing and long-term care facilities and numerous other housing sectors. For additional information, please contact CleanCut at (877) 882-7837 or visit https://www.cleancutbath.com.